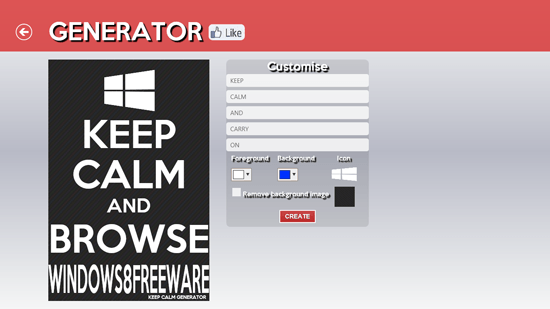 Keep Calm Generator is a free Windows 8 and 8.1 poster making app that helps you create posters based on the concept of Keep Calm and Carry On. This free poster making app has been inspired by the famous motivational poster that was produced by the British government for the preparation of Second World War. The poster was rediscovered and commercialized later on, followed by conflicts. 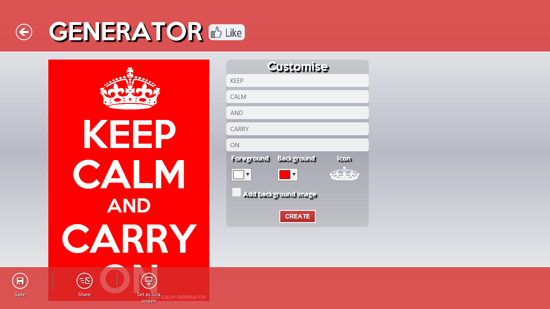 Keep Calm Generator can help in making various kinds of Keep Calm posters. There are different background templates, icons, color for background and foreground in the app that can be changed according to what what you want the poster to be like. There are no additional settings for any kind of photo upload in the poster, changing the font of the text on the poster or resizing the poster’s length or width. All the text you want to write can be written using the input fields on the screen near the poster. The text can be written in five lines, so you can divide or write the text according to that. You don’t have to worry about the size of the font when you write a big word or sentence as the app itself defines and adjusts the size of the text. You can save the poster you created with Keep Calm Generator directly to your computer by right clicking anywhere on the app’s screen and choosing save. Alternatively you can share it with your friend using the email integration or export the poster to the other app. You can also choose the option of setting the poster as your lockscreen image. If you have loved seeing the Keep Calm posters on the web and thought of making one for yourself but did not know how to make them then this app is a perfect answer for the question.